MSV: Mayor slams MSTA event and recounts earlier threat by sponsor's son to "run me over"
Mayor slams MSTA event and recounts earlier threat by sponsor's son to "run me over"
In a statement issued to Hudson County View on a MSTA sponsored tax event yesterday, Mayor Dawn Zimmer slammed the forum as a "coordinated political misinformation campaign." In addition, the mayor for the first time went public with details of an alleged threat made last summer to "run me over" with a truck by a son of another sponsor, Joe Hottendorf of the Liberty Board of Realtors. The mayor's statement highlights the threats were publicly made last summer on Facebook and an unknown municipal judge (not in Hoboken) deemed the threat of no concern. The apparent goal is to disseminate inaccurate information about Hoboken taxes for the purpose of misleading voters in the November 3rd City Council elections. Ironically, the facts that refute their claims can largely be found in their own data, as published in the njrealestatetaxes.com website. In 2014, the year Hoboken conducted its property revaluation, the County tax levy borne by Hoboken taxpayers increased by 14%. Our school tax levy increased by 3%. Our municipal tax levy increased by 6% of which approximately 4% (2/3) was attributable to statutorily required increases in our library and open space taxes. Hoboken’s discretionary municipal tax levy increased by only 2%. Since 2010, Hoboken’s municipal tax levy has declined by 6% while Hoboken’s County tax levy has increased by 48% (28% due to the equalization formula and 20% due to increases in the total County tax levy). Put simply, our county taxes have skyrocketed over the past 5 years while our municipal taxes have actually gone down. MSTA and the Liberty Board of Realtors are engaging in a misinformation campaign intended to advance their own interests at the expense of the Hoboken taxpayer and the truth. The public should also be aware that Mr. Hottendorf’s son, Joe Hottendorf Jr., posted on a Facebook page over this past summer, what in my opinion felt like a threat to run me over on my bicycle with his truck. When interviewed by the Police, Mr. Hottendorf claimed that his threat was a joke. The charges against him were dismissed because a Judge ruled that Facebook posts were private communications. The Judge ruled that Mr. Hottendorf’s threat could not reasonably cause concern to me, despite my testimony that his threat in fact caused me serious concern. 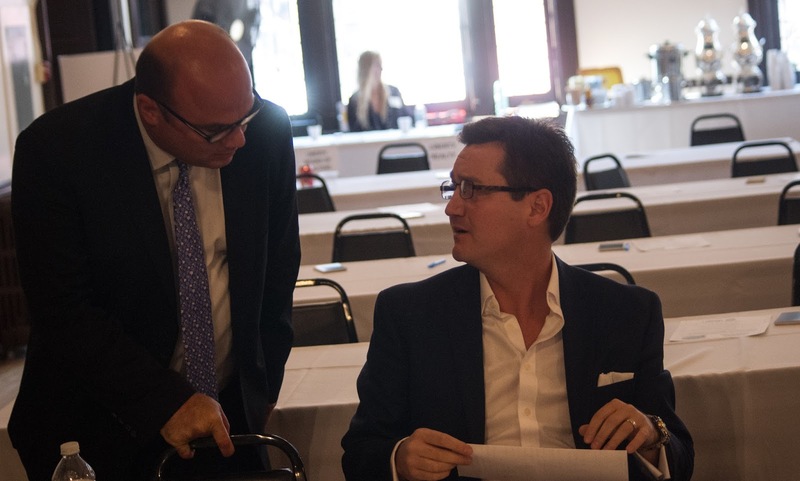 MSTA's Ron Simoncini confers with David Liebler at yesterday's "Hoboken Spoken" forum. The event was sponsored by MSTA and the Liberty Board of Realtors. Mayor Dawn Zimmer went public on an alleged threat by the LBOR head's son Joe Hottendorf Jr.